Beef in Herb Wine Sauce 3 or 4 medium onions, sliced 2 Tablespoon Bacon drippings 2 # lean Beef (Sirloin tip) cut into 1 1/2 in cubes. 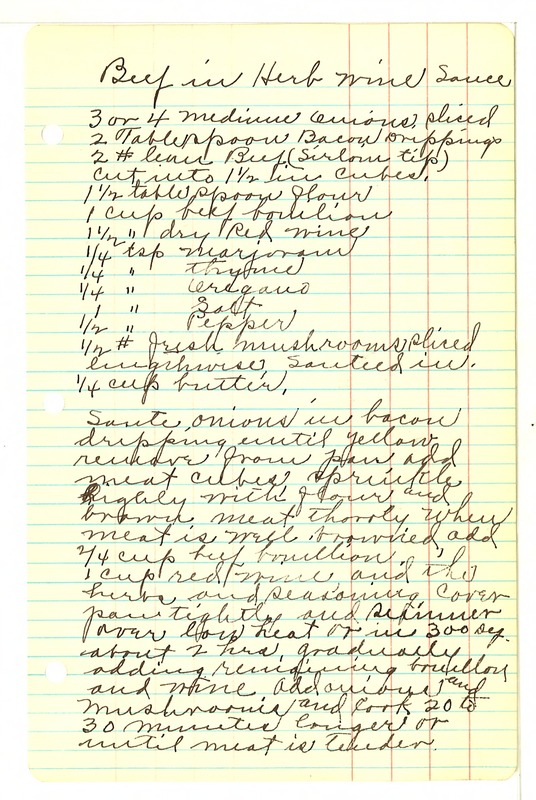 1 1/2 tablespoon flour 1 cup beef boulion 1 1/2 " cup dry Red wine 1/2 tsp marjoram 1/4 " thyme 1/4 " oregano 1 " salt 1/2 " Pepper 1/2 # fresh mushrooms sliced lengthwise, sauteed in 1/4 cup butter. Saute onions in bacon drippings until yellow remove from pan add meat cubes sprinkle lightly with flour and brown meat thoroly When meat is well browned, add 2/4 cup beef boullion 1 cup red wine and the herbs and seasonings. Cover pan tightly and simmer over low heat or in 300 deg. about 2 hrs. gradually adding remaining bouillon and wine. Add onions and mushrooms and cook 20 to 30 minutes longer or until meat is tender.